If you're heard people buzzing about the Instant Pot this holiday season, you're not alone. As strange as it sounds, the Canadian-designed cooking appliance has become one of this year's hottest Christmas gifts, with many stores struggling to keep them in stock. Lindsey Meredith, a marketing professor at Simon Fraser University, compared the phenomenon to the must-have toys that end up topping children's Christmas lists every year. "Frankly, this is pretty unusual," Meredith said. "Fad stuff usually belongs to the kiddies – the Cabbage Patch Dolls, the Xboxes. Suddenly you have adults chasing down… a pot to cook in." The Instant Pot was created by a team of engineers in Ottawa back in 2010, but word of mouth has slowly turned the appliances into a sought-after item for many families. The devices are marketed as capable of steaming, sautéing, slow-cooking, yogurt-making, food-warming and pressure-cooking, and if social media users are to be believed, they do a pretty good job. Dozens of Facebook groups have popped up dedicated to sharing recipes and tips, with names like "Instant Pot-heads" and "Instant Pot Addicts." Many cater to specific diets, such as "Kosher Instant Pot" and "Keto Instant Pot Community." A flood of recipe videos on YouTube also helped the kitchen appliance's skyrocketing popularity, with some clips racking up hundreds of thousands of views. 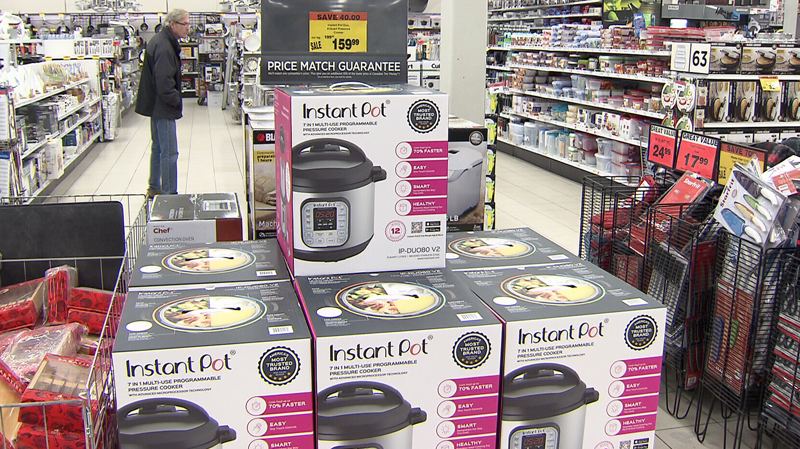 One Canadian Tire on the North Shore is sold out of the smaller, cheaper Instant Pot model, even though staff saw the demand coming. "We did have some foreshadowing before the Christmas season that it would do well, but it went even beyond that. It's outperformed expectations," manager Julian Wamboldt said. The same model is also currently sold out at every Canadian Tire in Vancouver, Richmond and Burnaby. Wamboldt said he’s hopeful they’ll have more in stock over the next couple weeks, however. If they don’t, there might be some disappointed parents on Christmas morning. The Canadian-designed Instant Pot, which was created seven years ago, has become one of the year's hottest Christmas gifts.